Vogue Italia has recently launched a trio of new websites showcasing the topics-du-jour of the fashion industry. Vogue Curvy provides a glimpse into normal and plus-size beauty, devoted to ... women with figures. 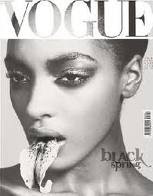 Vogue Black provides insight on beauty of color, devoted to black talent in fashion. Vogue Talents takes a look at up-and-coming designers and encourages users to submit their work.